Imagine: you’ve had your office copier for a while and everything is working fine. Suddenly, you get a call from your copier leasing company informing you that your copier has been discontinued. You think about upgrading, but the one you already have is working fine. 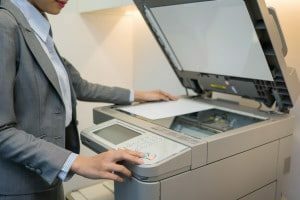 This can be a stressful event if you’re not prepared, but at Copier Chicago we are going to help dispel the myths about maintaining a discontinued copier. Copier companies discontinue copiers all the time. They want to get their best and newest machines into offices across the country. Salespeople are incentivized to sell these newer copiers to help get the old copiers out, and new models in. However, there is something that the copier companies do not want you to know. When a copier company, like Xerox, discontinues a copier they are legal bound to keep parts in the pipeline for at least 5 years. That means that you should still be able to maintain your discontinued copier with ease as long as it has not been at least 5 years. So, if your copier leasing company calls to inform you that you copier has been discontinued they may true and upgrade you to something new for a small increase in monthly payment. You must do you part to figure out when the copier was discontinued. If your copier was discontinued last year and you only have 2 years left on your lease then you can maintain your copier for the rest of your lease without issue. If your copier was discontinued 4 years and and you still have 3 years left on your lease you may consider upgrading. Copier leasing companies are not always in it for themselves. They may be telling you the truth and offering a great deal. You just have to do your part to make sure that you are not being tricked.